CAST: Babe Ruth (himself), Ruth Taylor (Mildred Tobin), Margaret Sedden (Babe's mother), W.J. Gross (Eliar Lott), Frances Victory (Pigtails, Babe's foster sister), James A. Marcus (Cyrus Tobin), William Sheer (Harry Knight), Ralph Harolds (John Tobin), Charles Burt (David Talmadge), Ricca Allen (Almira Worters), George Halpin (Doc Hedges), Walter Lawrence (the barber), Anne Brodie (the barber's wife). Babe Ruth lives in the small town of Haverlock with his mother and young foster sister, Pigtails. There are two interests in his life -- playing ball and Mildred Tobin, the banker's daughter. However, banker Cyrus Tobin brings a new pitcher, Harry Knight, to town for the Haverlock team and puts him to work at the bank where, unknown to Cyrus, Knight is embezzling money. Cyrus encourages Knight's relationship with Mildred, and it seems that every time Babe tries to get close to her, Knight edges him out. The day of the big game with Highland, Cyrus is handing out new uniforms. Knight threatens to quit if Babe gets a uniform, so Babe is turned out. When the manager for the Highland team finds his pitcher too drunk to play, he hires Babe to fill in the void. Then, when Babe hits the winning homerun for the Highland team, the townspeople are so angry, he has to leave town. Babe ends up saving Mildred from the lecherous Knight and is responsible for Cyrus' errant son, John, returning home, placing himself in the good graces of the banker. Also, after leaving town, Babe works his way up the majors where he becomes a big star. "The Best Thing is Babe"
It must be admitted up front that "Headin' Home" is a mediocre story and the greatest appeal of the production is being able to see the great Babe Ruth in his younger days, with some great footage of him in action at the old Polo Grounds. But that's not to say the story doesn't have many good points that also make it enjoyable to watch. The producers stuck to the tried and true in their story and didn't take any chances stepping into new or innovative territory. We have the Babe in a small town with the quintessential loving mother, an adorable younger sister who has an even more adorable little dog (named Herman -- for those who don't know, the Babe's middle name), the love interest who is more interested in the newcomer than our hero, and, finally, the newcomer is, as he must be, a scoundrel. There are several more characters -- actually too many of them -- and none of them are developed well. One that shows promise but whose potential isn't realized is the character of Almira Worters, a spinster-type who considers Babe the handsomest man in town. We would expect her to aggressively pursue Babe and that he would be sufficiently shy to result in at least a few comedic moments, but other than her "mooning" over him, it's almost as if he doesn't know she exists. The character of the dog catcher, Doc Hedges, is developed somewhat better as a busybody who always seems to be around spying on Babe. One humorous scene has Babe wading out into the town lake to meet Mildred's canoe. Doc Hedges chides Babe for "breaking the law," but the Babe chases him down and throws him in the lake. Throughout the movie, Doc is afraid to get too close to the big guy. Babe's character could have been developed better, too. The only outstanding trait the writers seemed to focus on is his ineptness at about everything except swinging a bat. The story picks up interest and begins to show promise when the time for the big game between Haverlock and Highland arrives. New pitcher Harry Knight, who was brought to town by Mildred's father, Cyrus Tobin, dislikes Babe because of his rivalry for Mildred's attentions. When game day comes and new uniforms are being handed out, Knight says he will quit if Babe gets a uniform. Not wanting to lose his star pitcher, Cyrus tells Babe he won't play. This is the emotional peak of the film -- and probably the only emotional moment -- but it is played well by the Babe as he ambles off, hurt and disillusioned. However, when the manager for the Highland team recruits Babe to fill in for a drunken pitcher, he not only gets his chance to prove himself, he is given the opportunity for some payback to the scoundrel Knight. True to our expectations, the Babe must come through at the last minute and win the game. Our hero is held at bay and the tension mounts throughout the game as a crooked umpire calls strikes on a variety of unhittable pitches. 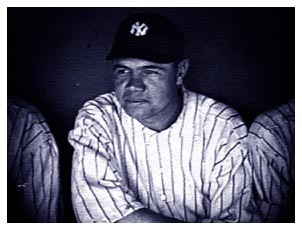 So, the Babe is called out because he is never given the chance to swing the big bat he carved from a tree -- that is, until one good pitch is thrown in the ninth inning which he sends over the fence and through a church window five blocks away!! The impetus that drives Babe away from a futureless existence in the small town is the ire of Haverlock fans that one of their own has caused them to lose the big game. So, Babe heads for the train station that night. Before he leaves, though, he is able to rescue Mildred from Knight who is trying to force her to go away with him on the evening train. With this good deed under his belt, he goes on to great success in the minors building a rapid reputation for himself and giving the people of Haverlock a native son they can brag about. "More Than a Hero on the Field"
The story isn't over yet, though. Early on in the film, we were introduced to John Tobin, Mildred's brother, who had "fallen out" with his father and left home. We were introduced to so many characters in the beginning, young Tobin appeared to be just one of the numerous nondescript denizens of the small town. He reappears, however, in some other town where Babe is playing ball. We aren't given any background, and don't really know what's wrong in young Tobin's life, only that the Babe recognizes the young man is about to be "taken" by his female companion. Just as suddenly in the final minutes of the film, John returns home to his father and sister saying Babe was the one who convinced him to return. There is no development whatsoever to this aspect of the story. It just appears to be one more good deed that gets Babe in the good graces of Cyrus Tobin. In the end, we see a large contingent of the Haverlock residents at the Polo Grounds watching Babe belt out a homerun. Of course, he has won the girl, Cyrus is proud of his son-in-law, and everything's fine. From a story standpoint, the ending comes quickly, almost without warning, and in a very unsatisfactory manner. From the point in the story when Babe leaves Haverlock until he plays for the Yankees, the story whips along at a speedy pace - almost too quickly - as if the writers were only anxious to wrap up things so we could see some real footage of Babe in action, which, actually, ain't a bad thing. The entire story is told from the standpoint of an old codger, Eliar Lott (get the name?). At the start of the film, we see him in the stands at the Polo Grounds as he begins to tell the story of the famous ballplayers who hails from his hometown. 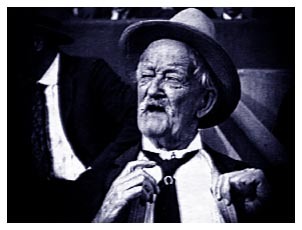 The film ends with a return to Lott as he finishes the story and we see actual footage of Babe hitting a homerun in a real game. It also appears that the writers felt it was appropriate to have all of the titles written in the third person since the story is being told from the old timer's point of view. However, this, too, makes it more difficult to realize well-defined characters. It's a very impersonal way to approach a story as if we are viewing them from a distance and are not allowed to hear what they are saying. Admittedly, the humor in the titles does add to the film, though. They were written by sports humorist "Bugs" Baer, and every title in the film was written for a laugh. For example, when introducing Babe's admirer, the title reads, "Almira Worters thought Babe wuz the handsomest man in town. Haverlock ain't a big town." Or in referring to the barber's marriage, the title says, 'Th' barber and his wife might have been happier if they both hadn't spoke the same language." And in another title, "Love makes you go through fire and water. Marriage throws water on the fire." The film is littered with this "jokes." Take your pick. Babe Ruth was 24 years old and playing for the Boston Red Sox when he broke the homerun record with 29 over the fence in 1919. He was also successful on the mound setting a record in the 1918 World Series with 29 consecutive scoreless innings. But it must be added that in addition to a remarkable talent, Babe also had charisma which added much to his popularity, and which comes across to some degree on the screen. It was most likely at this point in time that he was approached to appear in a movie, an likely endeavor for some adventurous entrepreneurs like Kessel and Bauman, whom silent movie fans remember as the original backers for Sennett's Keystone studio. It is unknown exactly when filming took place - most likely during the hiatus between the 1919 and 1920 seasons. It made its premiere at Madison Square Garden in September, 1920, and the timing couldn't' have been more perfect. As if weren't enough for the Babe to break the homerun record the in 1919 with 29 blasts over the fence, he almost doubled his own record in 1920 with 54 homeruns! No doubt, the backers of the film were more than pleased with the timing of this fortuitous feat. With Kessel and Bauman's backing, the film was produced by an independent company (Yankee Productions) and was sold on a state rights basis. Unfortunately, Babe had to sue the makers of the film who had promised him $50,000 and only paid him $15,000. 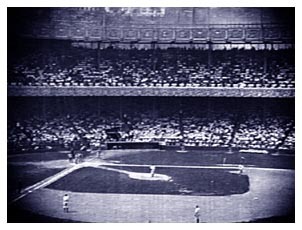 The location of the game footage in "Headin' Home" is the old Polo Grounds in New York which, at the time of the filming, was shared by the Yankees and the New York Giants. Such was Babe's popularity, that increased revenue for the team allowed them to build Yankee Stadium in 1923, thus the nickname, "The House That Ruth Built." "Reviews - A Difference of Opinion"
Variety (September 24, 1920) was not impressed with the film saying, "The story as a story is ridiculous and isn't convincingly enacted. It couldn't hold the interest of anyone for five seconds if it were not for the presence of the great athlete. He, and he alone, makes it worth five minutes of anybody's time." The New York Times (September 20, 1920) was uncharacteristically kind. "They try for comedy, not heroics, and score not infrequently. The picture is really entertaining in places, and that is a lot to say for a production of its kind. It would be better if it were only two reels long -- there's not enough to it to fill more -- but let it go as it is, and thank it for what it doesn't try to do as well as for what it does. 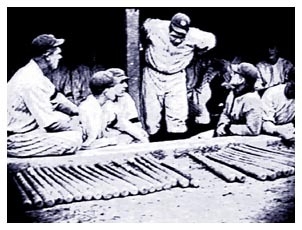 Also there are many excellent pictures of Babe Ruth in it -- and he is an interesting person." Photoplay (December, 1920) also liked the film, saying, "There is a real plot and a counterplot and enough views of Ruth to please the most inveterate 'fan'." Ruth only starred in one more film, "Babe Comes Home" (1927), but he also appeared as himself in 11 more films, the most famous silent being Harold Lloyd's "Speedy" (1928), with his last appearance being in the Lou Gehrig bio "The Pride of the Yankees" (1942). Ruth died in 1948 at age 53. A final note must be made about Ruth's leading lady in this film -- Ruth Taylor. The Internet Movie Databse lists her as the same Ruth Taylor who started out in Sennett Comedies around 1926 and became famous when she was chosen for the role of Lorelei Lee in Anita Loos' "Gentlemen Prefer Blondes" the next year. However, this is not the same Ruth Taylor. The star of "Gentlemen Prefer Blondes" (1927) was born in 1907 and didn't graduate from high school (in Portland, Oregon) until 1922. The AFI Catalog lists Babe's co-star as having made only two films, "Jack Purlock, Prodigal Wild Honey" in 1918 and "Headin' Home" in 1920. Nothing else is known of her. The video used for this review is the Grapevine version and is very good quality with some occasional dark places here and there. The contrast if very acceptable. There is a DVD version from American Home Treasures available. Reviews seem to indicate, however, that the Grapevine version is a much better print.